Few experiences can rival a journey to the winter wonderland at Frances Lake and you'll take everlasting memories with you. Imagine sunlight cascading through spruce trees onto a virgin blanket of snow — or lucent ice crystals sparkling in the frosty clean air. Our winter adventure will stir emotions and lead you into breathtaking scenery. Make your own snowshoe tracks in the dazzling white snow, or glide on cross-country skis along charming ski trails. Enjoy your own cozy log cabin and a crackling wood fire offering comfy warmth. And at night you'll marvel at the brilliant starry sky and gaze completely flabbergasted at the northern lights dancing across the canopy. The incredible silence may only be interrupted by the howling of the wolves. Another highlight is flying in by ski plane, which will land and take off right in front of the lodge on the frozen lake. At this time of year there are no other people out here, but you might spot a few moose, hares or otters in the vicinity. There is no noise, no roads, no other signs of human occupation, just vista after vista of snowy mountains, fairytale forests, frozen lakes and rivers — pristine wilderness as nature intended it. The perfect place to unwind and relax. Your cozy self-contained log cabin offers plenty of space and time to experience the northern winter at your own pace. The newly built, two-storey building is located at the other side of the lodge peninsula, about 10 minutes away on foot from the other lodge buildings including our private house. The cabin offers everything you need for an authentic Yukon winter stay. On the first floor is kitchen and lounge with comfortable armchairs to relax in front of the wood stove. A spacious bedroom (1 double bed and 2 single beds) is situated in the loft with great views out of the window – ideal for watching the northern lights. You will get your water from the lake through a hole in the ice and prepare your own meals with the groceries you brought in. Just behind the cabin is a traditional outhouse for your convenience. For a detailed cabin description (summer) see Cabin Rental. After arrival by ski plane, we will bring you to your heated, cozy log cabin. We will show and explain you everything you need to know that you'll soon feel comfortable in the new environment. On the first evening we will have dinner together in our private house. This allows us to get to know each other and discuss the upcoming week. On two days we will take you on a guided trip, during the other days you'll explore the charming winter landscape on snowshoes or cross-country skis by yourself. Snowshoeing: The idyllic setting of the lodge offers endless opportunities for shorter or longer excursions by snowshoes. Use our existing trails or make your own tracks through snowy forests, go exploring the picturesque bays and islands of the frozen lake or climb up to exciting viewpoints overlooking the winter wonderland. You'll be fascinated by the glitter and sparkle of the snow and ice crystals reflecting in the sun. 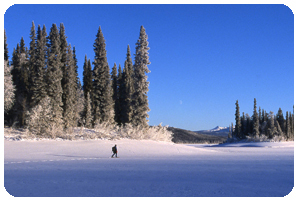 Cross-country skiing: We maintain a 10 – 15 km network of cross-country ski trails around the lodge, both for classic and freestyle technique. You're welcome to use these trails anytime. Also snowmobile trails leading further away can be used for discoveries by ski. Guided excursions: On two days we will take you on a guided trip to scenic areas somewhat further away from the lodge. For that purpose we will cover the first few kilometres on snowmobiles and then continue exploring by snowshoe or ski. We will be roaming through the Narrows section of Frances Lake's East Arm with good chances to see river otters playing in the snow near permanently open water holes. Log cabin romance: Enjoy the time in your log cabin to relax and revive. Read, chat and play in front of the crackling wood stove – or simply gaze out of the window watching the snow fall, the dusk setting in or the northern lights flickering over the sky. Due to the remote location, in winter our lodge is only accessible by ski plane. Flying in is possible from Whitehorse (1.45 h) or Watson Lake (45 min). The scenic flight over endless forests, mountains, lakes and rivers is an essential part of the entire experience. Northern winters are cold but dry. Therefore, even at cold temperatures outdoor activities can be performed and enjoyed. In February and March, you can expect lots of sunshine with day temperatures ranging between -5° and -30° Celsius. At night, temperatures may drop lower. The ice on the lake is about 60 to 80 cm thick and covered with a snow layer of 20 to 40 cm. When planning our daily excursions and flights by ski plane, we will always have to consider weather, snow and ice conditions. All tours are personally guided by lodge owners Andrea & Martin Laternser. We are experienced, licensed wilderness guides and First Aid-certified. In winter we only accommodate one guest party at a time. We gladly advise on your personal winter clothing and rental places in Whitehorse. Canadian legislation requires you to sign a release of liability and waiver of claims form prior to the beginning of your visit. Frances Lake Wilderness Lodge & Tours is a licensed business under the Yukon Wilderness Tourism Licensing Act and member of the Tourism Industry Association of the Yukon (TIA) and the Yukon Wilderness Tourism Association (WTAY). Personal insurance (trip cancellation, medical insurance). We strongly recommend our guests arrange for sufficient insurance coverage before the beginning of their trip. Depending on your place of departure and group size, ski plane charter rates are very different and subject to change at short notice. Ask for an individual quote. Multi-day winter trekking on cross-country skis or snowshoes in the East Arm of Frances Lake, with accommodation in a heated wall tent. We gladly arrange for an add-on dog sledding tour in the Whitehorse area.